Capriole take you to a land that has disappeared into the mists of time… when handsome knights performed feats of gallantry for beautiful ladies, when Eleanor of Aquitaine presided over the Courts of Love, Troubadores and Trouvères roamed, singing their haunting songs of love and lament. 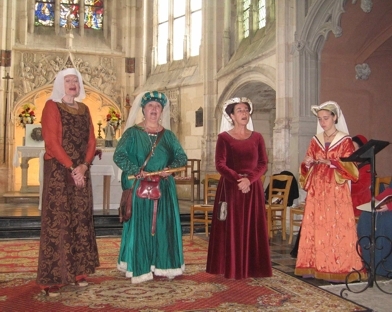 And later, when the Tudors reigned, Henry VIII danced and sang the night away, Queen Mary found solace for her absent husband Philip of Spain in music and dance, and Elizabeth’s Court was unrivalled in European musical culture. Mediæval music, Renaissance music of England, Burgundy and Italy – Troubadore songs, Trouvère songs and music of the Tudor Court… a banquet for the ear and the eye.